Despite the pouring rain outside I clearly still have picnicking on the brain, much like water, and have found myself searching around for one of those luscious rugs. The ones that are all belted up and ready to go. So vagabonding without the need to hop a plane or go solo. It might not be the most glittery of gifts but once people spot your inviting swatch of comfort they'll come from miles around, making it something rather endearing to offer others as well. 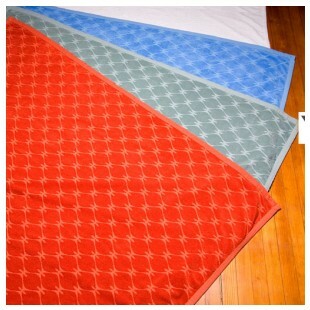 Finding a suitable blanket for a beach picnic / bonfire fête can be difficult as most, perfect for grass, do dismal on sand. To remedy this I've found that heavy and larger versions of beach towels fill the void perfectly. For example take a gander at the lovely offerings by Yumi & Laurie. Especially the St. Moritz (pictured), $225. and Laguna, $195. collections. Not only are they lush and heavy enough to hold their ground but they also boast being 100% certified organic cotton and bamboo. 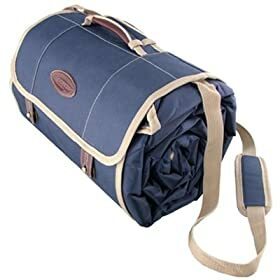 Looking far more like a sleeping bag (which can also do the trick but often times ends up being way too bulky and awkward to carry), the Highline Picnic Rug gets the job done for a reasonable $33 bucks. One of the more water and spill proof out of the bunch as well. If you too have been salivating over the Hermès leather blanket holder, a mere $780 mind you, take a look at the classic Woolrich blanker harness, also in leather for $19. It might not have the same thickness or luxe look but it does have the attached strap so you can actually tote your picnic rug without the need for an extra $500 belt (nice try Hermès!). Use any blanket you have on hand (wool works best) and look instantly with it and pulled together. 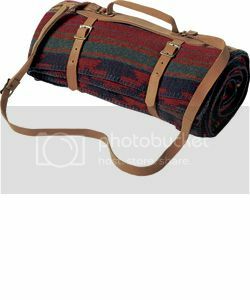 For those looking for the blanket and the harness together, as Woolrich has pictured above, take a look at the Optima wool blanket and leather holder offered by Lavish Giving, $136. with the added benefit of 20% of the purchase price being donated to the cheratible cause of your choice! Now that's really pulled toegther. See, Opening Ceremony got the idea as well. Check out the gorgeous roll for their latest Fall/Winter 2009 line where they team up with the cream of the crop of blanket makers Pendleton.